This process works perfectly on a small scale, but what if the project is bigger? What if, instead of a bag of garbage, the material in question was truckloads of dirt? 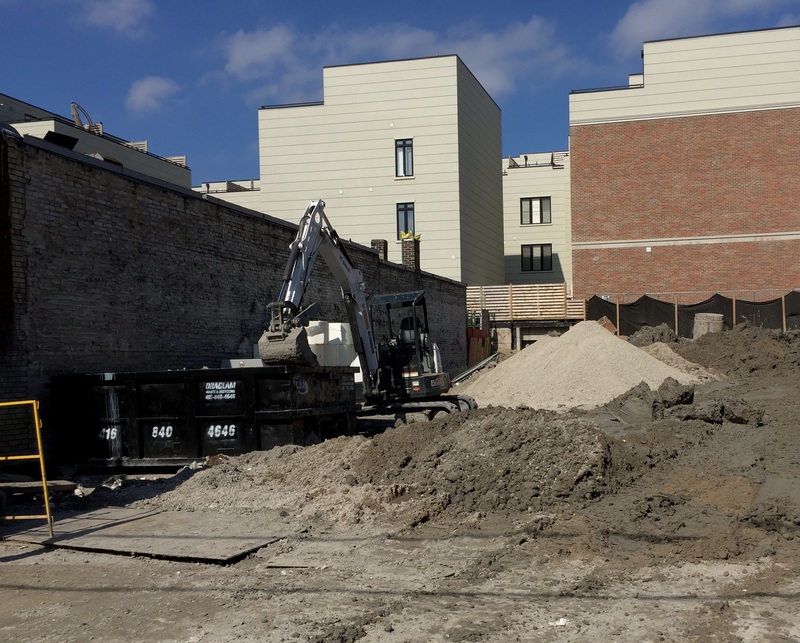 More specifically, hundreds of thousands of cubic metres of soil excavated at all Crosstown construction sites. All of this soil has to go somewhere, and with so much excavation still to happen, leaving it at the curb is not an option. Regulations for dealing with excess soil are developing in Ontario, but not yet enforced. Currently, construction companies are free to send soil off to a variety of locations including landfills. This means that contaminated soil from prior industrial or commercial sites (such as gas stations or dry cleaners) could accidentally get into the ground or water supply, causing environmental damage. Crosstown construction sites are leading the way in soil management techniques, however, by going above and beyond to dispose of contaminated soil safely and in compliance with the Ministry of Environment’s recommended guidelines. This is especially clear at two station sites: Avenue and Science Centre. Avenue Station is being constructed in one of the densest neighbourhoods on Eglinton, so space to store excavated soil comes at a premium. Because of this, the environmental team needs to arrange for quick soil disposal. Science Centre Station’s construction site is one of the biggest on the Crosstown, with the excavated pit measuring nearly 800m long. With so much soil to sort, the environmental team has turned to an advanced 3D modelling system. Every 150m, a sample of excavated soil is taken, tested and logged. Using GPS coordinates of each soil sample, the environmental team builds a virtual soil-map of the area to help workers on the ground differentiate. This way, soil is sorted and accounted for before being hauled away to the right disposal site. It’s not as glamourous as building a station or laying down rail, but proper soil management is a key component to keeping the Crosstown on track, while doing the right thing.